While a student at the Ateneo Municipal in Intramuros, Jose Rizal made a small statue of the Sacred Heart, about nine inches in length. 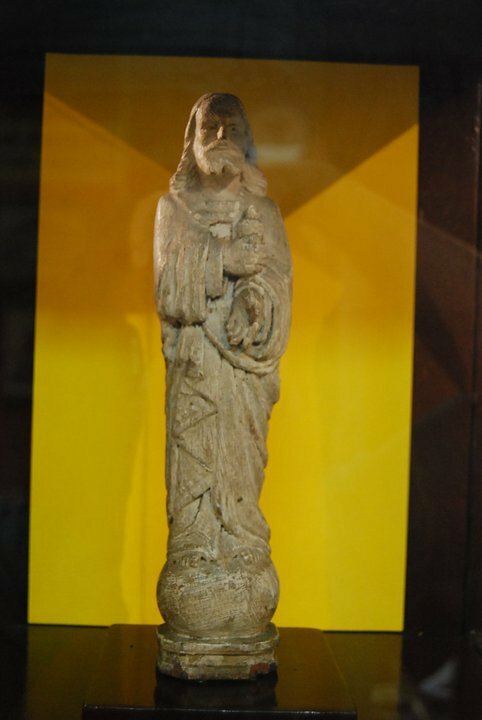 He carved the statuette in baticuling wood with a penknife at the request of his professor, Fr. Jose Leonardo S.J. The latter intended to take it with him to Spain, but the domestic helper forgot to place it in his trunk. It was left behind and was taken by Rizal’s fellow students. It was then placed on a shelf above the door of their study hall where it remained for twenty years. In December 1896, after Rizal was sentenced to death by the Military Tribunal on charges of treason, he asked for some Jesuit priests to visit him. Fr Miguel Saderra Mata, S.J., Rector of the Ateneo Municipal, together with Fr. Luis Viza, S. J., went in haste to Fort Santiago to the cell where Rizal was imprisoned. They were greeted warmly by Rizal. Rizal asked them if the statuette of the Sacred Heart which he had carved as a boy was still at the Ateneo. Fr Viza, in reply, took the statuette out of the pocket of his soutane. He had guessed rightly. Rizal would remember it at the hour of his death. Rizal took it and kissed it in his hands and placed it on the table where he would soon write the Ultimo Adios. The statuette remained in the cell. On the night before his execution, it was to Fr Jose Vilaclara, S.J., his former Physics teacher, that Rizal made his last confession and was reconciled to the Church. The following day, 30 December, before leaving his cell to go to Bagumbayan, Rizal held the statuette to his lips for the last time. With two hands holding it close to his heart, he moved slowly to give it back to the Jesuits who were with him to the last day. When the fire of 1932 engulfed the Ateneo, the principal concern of the Jesuits was the safety of the students. No one got hurt. Many valuable irreplaceable collections went up in smoke and presumably the statuette. The Ateneo resumed operations in Padre Faura. In 1945, the Ateneo was destroyed completely during the liberation of Manila. Some time in 1952, when Ateneo was in the Loyola Campus, Q.C., the statue was returned, presumably by the student who saved it from the 1932 fire, and inadvertently from the 1945 fire as well. Replicas made from ash from the bowels of the earth hurled into the sky by Mount Pinatubo in 1991 were distributed to friends. After some twenty three years in the Board of Trustees room, Fr. Bienvenido Nebres, the President, turned it over to the Ateneo University Archives. Rizal carved the statue for Fr. Leonardo. Did the Jesuit need one for himself, or did he want Rizal to develop his talent? Why did he ask Rizal to carve an image of the Sacred Heart and not of someone else, like Our Lady? Because he had seen the excellence of the statue of Mary that Rizal had carved. Rizal was the Prefect of the Sodality of Our Lady. What thoughts passed through Rizal’s mind as he carved? Did he have pictures of the Sacred Heart in mind? Did he research his subject? What did he know of the devotion to the Sacred Heart? What did his devotion, if any, to the Sacred Heart consist of? What does the actual statue say? What was the state of the devotion at the Ateneo? How did he think of carving a statue with a hole in the chest? It was painful for the nameless Brother that Rizal refused to even look at his statue. Would he have a statue if the houseboy had not forgotten? Would Rizal have thought of his statue in his cell if the Brother had not brought the statue as Rizal left? Did the Brother on his own or had someone asked him to show it to Rizal? How did Rizal feel when he gently rebuffed the gesture of the Brother? Did he feel sad? Was it like meeting a girl friend he had outgrown? On leaving his death cell, Rizal held to his heart, the statue of Jesus holding his heart against his heart. The statuette is that of a man whose left hand is hanging by his side with palm facing away from him. His right hand is bent at the elbow with his fist high against his left chest where his heart was. Held in that fist is a heart. The heart is surmounted by flames, and a crown of thorns encircles it. In the middle of the chest is an ugly jagged hole. Jesus is offering his heart which he has torn from his chest. In offering his heart he tells us, in deeds and not in words, that he loves us to the extent of giving his life for us. This is the message of the crucified Jesus. This is the message of the Heart of Jesus. On the cross, blood and water flowed out. By this he died. By giving us his heart, he dies. He is offering his heart not to be put beside our hearts. No. He is offering his heart to replace our hearts. “I will take your heart of stone and replace it with a heart of flesh.” I will take your human heart and replace it with the heart of God. God work is not accomplished until he has replaced with his heart the hearts of every man. He is not a giver until his gift is accepted. Jesus did not redeem the world by his suffering and crucifixion until the Father accepted it, when he raised him from the dead. He gives us his heart so that in turn we give our heart, his heart, to others. To have his heart is to love as he does. Greater love than this no man has than that he lay down his life for his friend. He loves us so that we become able to love like him. We cannot love like him until we have his heart. In 2005, Pope Benedict XVI wrote a letter to the Jesuits’ Fr. General, Peter Hans Kolvenbach, S.J. on devotion to the Heart of Jesus. Nowhere in his letter does he use the phrase “Sacred Heart”. It is always Heart of Jesus, Heart of Christ, or Heart of the Savior. From the beginning of the devotion, the Holy See has forbidden the representation of just a heart. Rizal’s representation of the Heart of Jesus as Jesus with his heart in his fist and with an Emptied Chest is not only unique, but dynamic and effective. Conventional representations show a symbolic heart adorning his chest, almost passive. The Society of Jesus has accepted the responsibility to spread the devotion to the Heart of Jesus as a munus suavissimum (most sweet mission orders). article like yours. It's pretty worth enough for me. Personally, if all web owners and bloggers made good content as you did, the internet will be a lot more useful than ever before.